Something’s happening – happening to me. My friends say I’m behaving peculiarly. Come along now baby, we better make a start. You better make it soon before you break my heart. I thought that was an apt quote – and one that should efficiently destroy any credibility I have if you know where it’s from (guesses welcome). Arsenal owe us a proper performance today. If we lose – god forbid – I can see things starting to get nasty. The team news is pretty good. Jack Wilshere and Bacary Sagna are both fully fit and included in the squad, Alex Oxlade-Chamberlain will have a late test, and there are no fresh concerns to anyone. Theo Walcott and Kieran Gibbs both still miss out, along with the regular bunch of absentees. The team selction should be interesting. I’ve heard many theories over the past couple of days, and guessing what Arsene will do isn’t going to be easy. Given their awful performances on Wednesday, he might be tempted to exclude Gervinho, Santos and Ramsey, but I doubt he will leave out all three. There have been rumours Serge Gnabry could be in line for a start, but if we’re pinning all our hopes on a 17-year-old with minimal experience to get us out of a slump, we have problems – I doubt that will happen either. What could happen, and I hope it does, is the inclusion of Koscielny to partner Mertesacker, and Vermaelen deployed at left-back. Andre Santos doesn’t look fit, and he was at fault for both Schalke goals with his positioning. In general, he was completely bloody useless, and I’m not sure his fellow players have any confidence in him. I also think both Sagna and Wilshere will feature, although I’d guess Jack will be on the bench to begin with. I’ve opted for Giroud as the experiment with Gervinho up front hasn’t worked, and we have to start with the Frenchman instead. He’s never going to build up any confidence if he is continually benched in favour of someone who ordinarily wouldn’t play in his position. I wouldn’t be surprised to see Gervinho benched, too – if The Ox passes his late test. All in all, I shouldn’t really be concerned about today’s game, but I am. QPR will know that they’re facing us at a good time, and if they nick an early goal, the crowd will probably start to get on the backs of the players. We need to come out of the blocks fast, and try to put this one to bed as soon as possible. We should have more than enough in the locker to win, but the way things are going, there isn’t much that would surprise me. I’ll go for a 3-0 win, with a bit of happiness restored. If yoou fancy a flutter on the game, head on over to Bet Victor. Thanks for reading today, you wondrous creatures. The comments await your opinions and preferred starting 11s. I look forward to reading a few. I shall return tomorrow with a review. I think Wenger/Arsenal FC should pay off Arshavin,Squillaci,Santos and Chamakh in January if no buyers are forth-coming,so that adequate replacements can be bought to increase competition and inadvertently, performance. I know this will be controversial with some supporters but Wenger needs to adjust his tactics. 1. Every team we play be it in the champions league, premiership, capital one cup, FA cup, friendly, reserve league…, we play the same formation. It’s not too hard for teams to plan how to stop us. Why can’t we risk at times with 2 outright strikers. Other big teams try it out and it pays dividends for them. 2. Why do our substitutions only ever come after 70- 75 minutes? How long does it take for a “good manager” to see that a particular player is having an off day? How long is he allowing the substitutes to make a meaningful impact? 3. Wenger is too proud!!! He thinks he knows it all!!! Not seen him watch opposition teams, I doubt he allows Steve Bould to make his mark on the team- that’s why he got rid of Martin Keown. Remember Keown helped us reach a final with Senderos & Flamini in defence!! !- then Wenger changed it in the final & we lost it. He needs to swallow his pride & offer Walcott a new contract + play him upfront with Giroud. Then we have 2 contrasting but potential goal scorers. 4. Arteta has a great touch the ball record but am wondering whether that plays to our opponents advantage mostly. Do opponents track back quicker because of those many touches? Our midfield needs a quicker passer through the middle, Viera, Petit, Fabregas…. gave us a quick long penetration pass and they ended up in the box. You’re absolutely right. 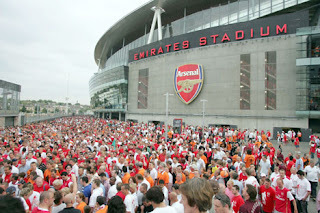 Wenger should know that we are in competion and not escorters. Points are very important in every game. I think HE should swallow his pride n make right decisions. and i must say i am a little disappointed there is no update about the dressing gown………………. I dont see how wenger would sign a player as defencivly useless as Santos.. surly he must have watched a few of his matches and not just his attacking highlights? ?